Over the past two years, I have cultivated a closer relationship with my car than most people in my life. My commute is the longest it has ever been in my professional career. The time can range from 50 min to 90 plus. There are a few behaviors that make these daily miles more tolerable than others. The most effective activity for me to keep my sanity and not be bored is listening to PODCASTS on my commute. This is the key to my sanity and anti boredom. Most of the podcasts are writing and reading related which adds to my TBR list. I am always looking for great recommendations. There is lots of coming and goings so I have time. I spend way too much time in my car. I heard on a podcast this morning there was a woman that went to her car to write because that was the only place she could find silence. The idea of spending more time in my car makes me physically ill. Being in the car is necessary and I have found some ways to tolerate it. One of the underlying reasons WHY I tolerate the commute is because it brings me to people that I honestly enjoy working with. I have never worked in a building with such professional, well rounded wonderful people. I probably should use a better word than wonderful…They make my heart happy. Truly, Not an easy feat in my world. The drive time is good transition time from home to work and work to home. I can think about my day on the way in and send emails and texts and make my burn list (what I am currently calling my to do list). I do get some work done. One pitfall is that I drive East in the morning and West in the afternoon. Happy am I on days that are cloudy and/or rainy because I do not get blinded by the sun. The driving is easier. The transition time also allows me to really be home when I am home, and at work when I am at work. This has not always been the case for me. I used to do hours of work at home. The time also allows me time to think and create and dictate to my phone. Commuting harms our psychological health and social lives.” from Psychology Today from Jan 12, 2015 the average commute is 25.4 minutes. Anything over 90 minutes according to the article is categorized as a “mega commute”. If the traffic is flowing I tolerate the drive better, partly because the drive is then shorter. I cannot control the unpredictability of the traffic. I cannot push the people in front of me to go faster or to get out of the lane that I think that they are driving too slow in whatever lane they have decided to mistakenly drive in. I also do not have the magical ability to snap my fingers and move cars over on the road…or off the road. If there are issues, then I push into the mega commute time frame which makes me cranky….quite cranky. Which is not good for my health – or the wellbeing of the people around me. There are many health risks associated with a commute that is longer than 30 min including high blood pressure, lack of sleep, higher exhaustion levels, back pain, and higher risks of anxiety and depression (TIME, Feb 26, 2014). There are days I am physically uncomfortable and I can’t settle into a comfortable position in the driver seat. I readjust to no avail. I do positive frame a lot of situations on the way to and from home. There are things now that make me happy and less stressed that never even crossed my mind before: new tires, a fresh oil change, a full tank of gas, an open road with no construction. Another idea that makes me happy is when I have a day off the first thing I think about is that I don’t have to spend 2 hours in the car. There is a ritual and a routine to it. I check my WAZE app to anticipate an alternate route so I have a better chance to have the shortest drive possible. I also make sure that the PODCAST for the drive home is cued up and downloaded. Stress is a fact of life that will not go away anytime soon. I can positive frame as much of the commute experience that I can and make it as tolerable as I can. I will continue this pattern until I just cannot anymore and then this season will be over. There is always a chance that lottery ticket in my wallet is a winner! The more I find out about Ray Bradbury, the more I love him. As much reading about writing as I have done, I have never come across Ray Bradbury’s NOUN writing exercise. It is brilliant! I love lists and I love writing! It is perfect! Here is the link to the Brain Pickings article outlining his unusual writing practice. I started my own list and have been writing 100-200 word pieces using one noun from the list as a trigger. I am hoping this exercise is the key to unlock some of the stories that are hiding in my mind. The night. The Dark. The empty. The foot. The drawer. The book. The manuscript. The eve. The house. The fireplace. The castle. The moors. The pool. The date auction. The class. The ring. The roller skates. The pen. The candle. The heart. The mirror. The run. I asked some friends over the weekend to text me a short list of nouns to use as springboards for writing. This variation is more in line with the random word prompt. The lists are not my own so the emotional story unlocking potential is not as prominent. Here are opening lines of a story I wrote using this noun list: The Horse. The Banana. The Table. The Peanut Butter. The Glasses. It was a rainy, too warm October day when the horse dropped dead in the middle of the pasture. He didn’t know what to do with death. Peanut butter freed a six year old’s horses around the corner. The little one hid in a closet and wasn’t found for 2 days. A peanut butter and banana sandwich can be deadly in more ways than one. One bite taken out of the square white softness was enough to change a whole family, and the town they lived in. Jack took his glasses off and set them on the table and rubbed the space between his eyes with the two fingers of his right hand. They were stained with dark black ink as they always were. They were calloused and rough. He could hold balls of fire without pain. Maybe they could even resist death. He hadn’t had the opportunity to experiment. Jack joked and told people that he could handle the heat because of all the evil his hands had done.They never knew if he was kidding. My plan is to try this prompt with students as well to see what unlocks in their minds! http://storyaday.org/ This is my new favorite website. I came to it through a podcast episode from DIYMFA – I am in writing heaven! There is a podcast too! I love pizza! I could eat it everyday! 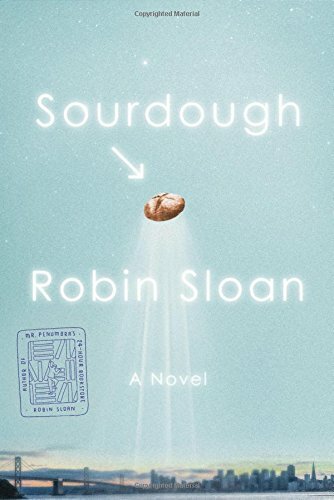 Sourdough was my choice for September Book of the Month (BOTM) club. I had first heard about it from the All the Books Book Riot podcast and was intrigued about a book about bread – my favorite food! The way this book is written can only be described as “happy”. It warms and comforts me like a hygge day! While reading it I can smell what my own house smells like when my husband is baking bread. The main character is interesting and not conventional. She is a tech person who has started to bake bread from a starter given to her by men who ran a restaurant out of their apartment. There is a quirkiness to the story that makes it fun to read and unusual, but also genuine. It is a book that I keep coming back to and I do not want to read it too fast because then it will be over. While reading it, you may get hungry for a great piece of bread and you may also want to visit your local farmer’s market before it closes for the winter! Reading this book reminds me why I love reading so much – I am captivated by a story about great people. I can feel the magic as the words enter my brain!